I explained to my rheumy that I went home, researched the medication and decided against it. First of all, she was giving me a medication to help with sleep without asking a very basic question, “Why aren’t you sleeping?” Well, I have young adult children who are up until three or four in the morning coming and going, cooking, talking, etc. I struggle to sleep well until I know they are home for good. I have a border collie who gets stomach issues in the middle of the night and for some crazy reason only wants me to let her out, my husband is easily awaken and sleeps next to me, I am going through menopause and wake up hot, and I have rheumatoid arthritis which brings issues of its own. The circumstances of my life right now don’t make it easy to get consistent sleep, but I don’t want to be knocked out. This is my life right now and I want to be aware of what is happening in my home and to the people I love. Plus, do I need an antidepressant? No! Right now, my mental health is good. Let’s save that for a day when I might really need it. I was happy that my rheumy backed me up on the idea that a new prescription, especially an antidepressant, should always be thoroughly discussed before prescribed. It is definitely not a medication you hand out casually as someone is leaving. We both agreed that we should always use caution when adding new medications. I am already on some heavy duty stuff. Great consideration would have to go into adding another long-term pill to the mix. Overall, I felt it was irresponsible of the neurologist but also a great reminder to myself that we ALWAYS have to be our own advocate. We have to do our own research. We have to make our own decisions. In the end, we are ALWAYS the experts on our own bodies. I think your statement on this issue is perfect. Recently I had to stop two blood pressure medications. I got to this point after I fainted and broke my ankle. I hassled with the cardiologist over removing the medications. Now, my blood pressure was fine. It has always been fine. I was using the BP med because I have had diabetes for a bit and BP medications are a standard preventive medicine for people with diabetes. but darn doctor I was fainting. I broke my ankle. Oh yeah, lets remove those, my doctor said on appointment number 3. Whew thank goodness. It is my experience is that getting off is way more trouble than getting on. So with you on this, Cathy. I'm still working on the relationship with a new GP – that had a bit of a set back the day he prescribed an antidepressant for nerve pain when I went, in desperation, about the state of my shoulders. Because it's just the beginning of the relationship, I didn't argue too much. I went home and trialled it for a week, and then stopped taking it. It made me REALLY foggy and a bit nauseous. Did nothing for the shoulder pain – because it's a mechanical issue due to the RA, NOT nerve pain, which I already knew. He'd refused the steroid shots I requested. I saw the rheumy a month later – HE did a steroid shot into one shoulder, which resulted in a swift and dramatic improvement. Seeing the GP again another month later, he had – on reading the notes from the rheumy – no hesitation in doing the second steroid shot. Gah!!! I had a jolly good vent about it on The Original Dragon Mother 🙂 Very frustrating though. Hear! Hear! 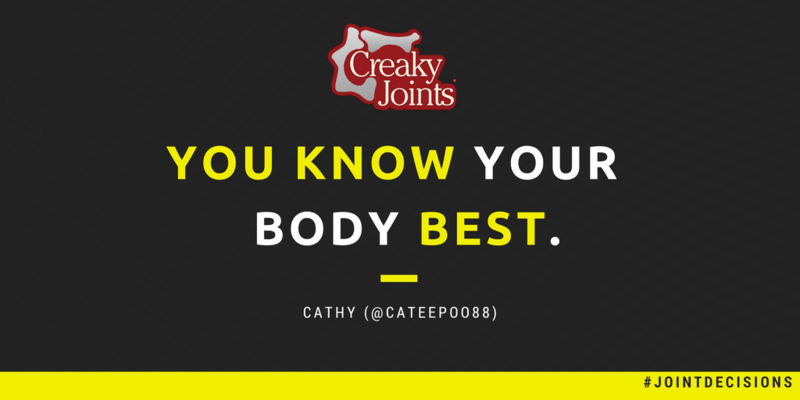 You know your body (& your life), best. What works for one, may not work for another.